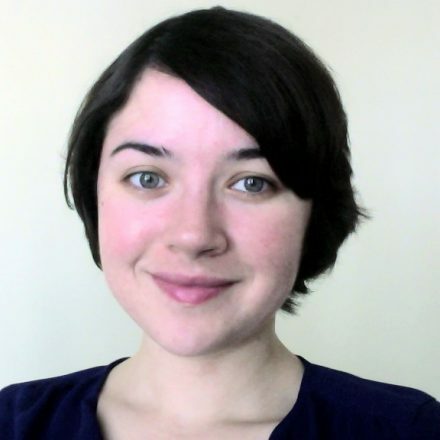 We all know that where you live dictates how much you spend on housing – a three-bedroom house in San Francisco costs several times that of a three-bedroom in nearby Oakland. 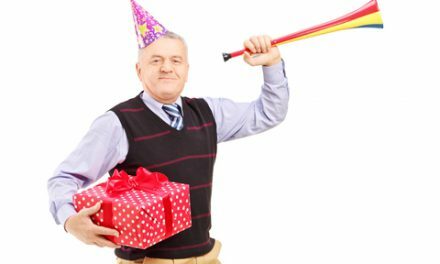 But where you work in relation to where you live – and how you get there – can also severely restrict your cash flow. The Department of Housing and Urban Development (HUD) has an online calculator, made to help families balance housing and transportation costs. This tool helps families figure out what neighborhood is most cost-efficient for them. HUD also has some interesting analysis of average housing and transportation costs for renters and homeowners, available by zip code, city, county and state, as of the 2010 Census. 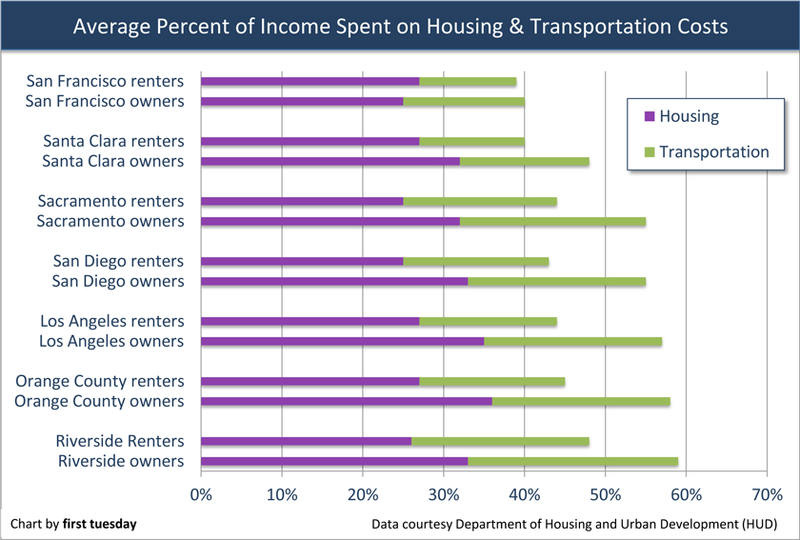 The general rule is renters spend less of their income on housing and transportation costs. However, renters also tend to earn much less on average than homeowners. Thus, while the share of income spent on transportation is less for renters, the actual dollar amount spent is likely even less than it appears. That’s because renters are more often found nearer to city centers (where public transportation is plentiful), while homeowners make up a greater share of a metro’s suburban population (where you pretty much have to rely on cars). What this chart shows is that it’s more expensive to be a homeowner, both in terms of housing and transportation costs. But the benefits of homeownership can be worth the extra distance to work and amenities. It all depends on your priorities. Also notable, the actual cost of housing is far more expensive in San Francisco and Santa Clara than down south in Riverside. But since incomes are limited for residents of Riverside and surrounding areas, (San Francisco incomes average more than two-and-a-half times Riverside incomes) even small expenses add up quickly. This is evident by the fact that residents of Riverside spending nearly as much on transportation as they do on housing. use of public transit, like buses and trains. San Francisco County (with the smallest share of income spent on transportation) leads for most transit trips taken each year, with the average person taking public transit more than once a day. 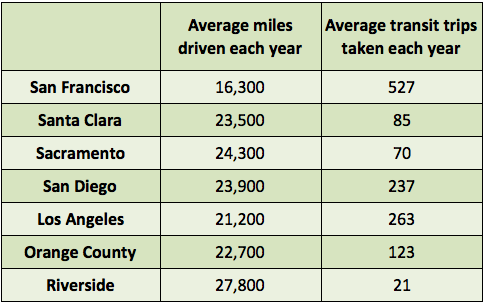 Likewise, San Francisco residents drive the fewest number of miles each year. On the other end of the spectrum, Riverside (with the highest income share spent on transportation) is number one for most miles traveled each year by car and the fewest number of transit trips taken. Editor’s note: San Francisco and Riverside are extreme examples, as each county has a vastly different size and population. However, the average commuting difference isn’t so great to make them incompatible examples. The average commuting distance in San Francisco County is eight miles, compared to Riverside’s slightly higher nine miles, according to the Brookings Institution. Thus, more transit trips and fewer car trips equals less money spent on transportation. Further, renters tend to take more transit trips and drive fewer miles than homeowners living in the same counties, according to HUD. 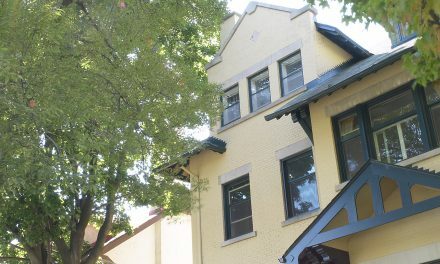 This is likely due to the location of rental properties – closer to urbanized areas – compared to those traditionally lived in by homeowners – single family residences (SFRs) in the suburbs. The high cost of transit is a vicious cycle to get stuck in, and one regular citizens can’t do much to break. One solution is simply for city officials to add more public transit options in areas where most people live – the suburbs. Highly urban areas generally have sufficient public transit options, making it much cheaper to rely on buses, trollies or trains to get to work than paying for car payments, insurance, gas and parking (not to mention dealing with traffic). But the suburbs are way behind. Of course, it’s not cheap to add accessible transit options to suburban neighborhoods. Since homes are spaced so far apart, bus stops and train stations are found few and far between. If you live in places like Los Angeles, San Diego or San Francisco, you’ll notice train stations can be near the most expensive neighborhoods, since living near public transit is a desirable amenity for buyers and renters alike. Thus, middle- and low-income families (who would benefit most from low-cost transportation options) can’t pay to be near to public transit. fewer parking requirements for new building projects near public transit. Still, it’s a long way between wishing for a fix and addressing your immediate commuting costs. While you wait for a transit revolution in your neighborhood, you can try carpooling. This cuts down transportation costs and can reduce commute time if you take a route with a carpool lane. The average share of carpoolers in the nation is just over 10% of all commuters, according to the Brookings Institution. In California, Bakersfield and Stockton have the highest rates of carpooling, at 17% and 15% respectively. The benefits of cutting down on transportation costs are significant. Currently, about 30% of all jobs in a metropolitan area can be accessed by public transit, according to a report by Brookings. That effectively takes 70% of jobs off the table for residents unable to afford a car and all the related costs. Hence the vicious cycle: most low-income individuals simply can’t get to higher paying jobs. Further, many of our state’s households living under the poverty line reside in the suburbs, where access to transit is most difficult to come by. Therefore, simply adding more jobs isn’t enough to guarantee economic prosperity for a region – they have to be able to be accessed by public transportation. With that in mind, when assisting homebuyers, remind them of transportation costs. It may not have occurred to them that spending more money to get closer to transit is more than an issue of convenience — it can also save money in the long run. If they are aware of specific numbers, they can make more informed buying choices. PreviousHow many recent college graduates does it take to rent an apartment? NextMay a junior mortgage holder collect on a deficiency after a bankruptcy court sanctioned the foreclosure sale?